In the latest of Through the Years, Don Dolbel and Eileen Barette tell Emma Baker what life was like during the German Occupation. Emma Baker talks to Don Dolbel and Eileen Barette about their memories in Jersey through the years. Our first feature starts in 1939. Both new and second hand wedding dresses will be available at the shop until Thursday 28th February. The New Year can inspire new hobbies, so we thought we'd look at quirkier pastimes enjoyed by islanders, starting with a clock enthusiast..
ITV Channel TV is live from Beau Sejour tonight to reveal the winning lottery tickets of this year's Channel Islands Christmas Lottery. This week we're bringing you the real story of Christmas, according to the pupils at La Hougette in Guernsey and St Michael's in Jersey. Santa Claus lands in Jersey! Santa Claus is coming to the island today to see if children have been being well behaved just before Christmas. POLL: What's your favourite type of pasta? 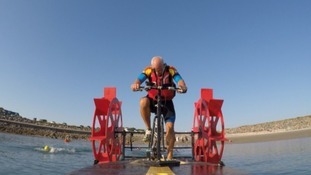 Graham Glass will race his invention 'Boaty McBikeface' against two swimmers tomorrow in aid of the Sarah Groves Foundation.